Firedance crossed the Rainbow bridge August 20, 2007. He was 22 years old. 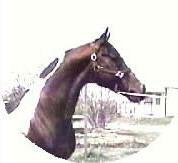 Many of you knew and admired Firedance for the champion jumpers and dressage horses he produced for Flying W Farms. Firedance had perfect manners and was one of the sweetest most gentle stallions you could ever hope to meet; He was a leading sire of champions and will be sorely missed by the world of Georgian Grandes and Sporthorses in general. He is buried here on our farm in Ohio. 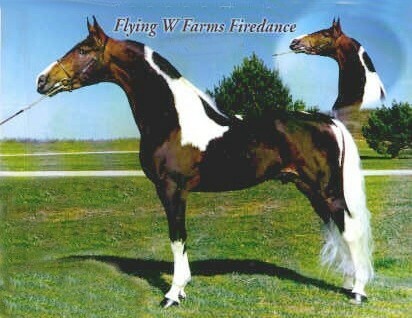 For those of you who may want a son or daughter of Firedance, his foals of 2008 will be his last crop. We are so grateful to our Lord for having allowed us to have Firedance all these years. The Lord giveth and the Lord taketh away, Blessed be the name of the Lord. proven sire of dressage champions!! !